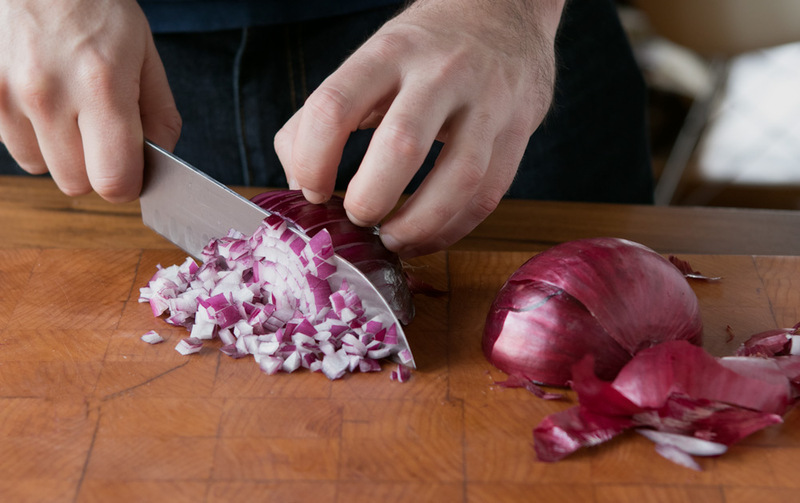 A great deal could be said––and has been––about the care of kitchen knives, but there is one thing that really sets their use and care apart from other blades that no one should ignore. 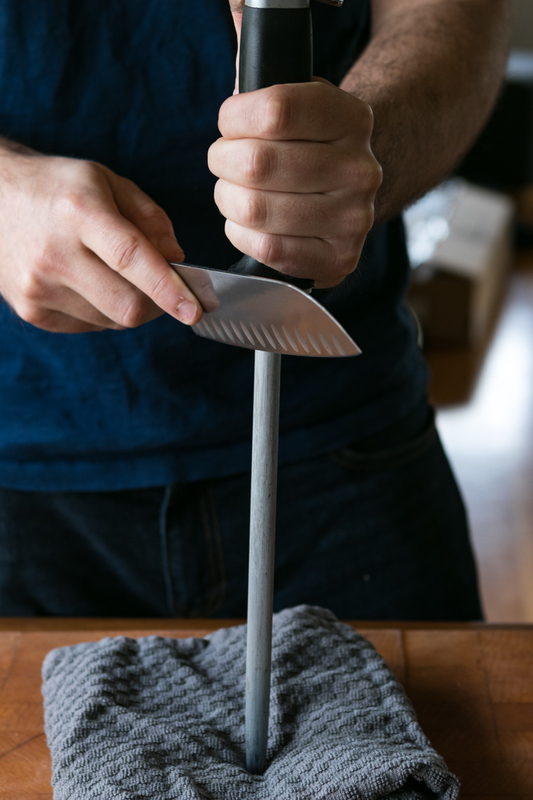 Kitchen knives do not only need to be sharpened on occasion––they need to be honed before every use with a steel. Note: steeling your knife is not sharpening, because you are not removing material, or grinding, a new cutting edge. Instead, steeling is re-aligning the edge that is already there to ensure that what is hitting your food is the thing that will cut it. When you steel your knives, every cut is like that first, effortless chop after sharpening. It gives you total control and allows you to make your knife do exactly what you want it to do. Constant pounding into food and cutting boards turns over the fine point that equates a sharp edge. Instead of a straight line (a wire edge), the cutting edge becomes a wavy set of turned over hooks. The steel grabs those hooks and puts them back in the same plane. What steel to should you buy? Steels come along in all of the very worst, cheap knife sets (so that big box outlets can sell a "9 piece set" with only 6 crummy knives, because the other 3 are a cheap steel, some shears and the knife block.) These are not the ones you want to use. A better move is to get a good one from a kitchen supply shop or online outlet that is well made and can accompany your knives as the tool that works on your tool. We like this simple option from Victorinox. It's only $20, and works great. You may be attempted to grab the steel in one hand and the knife in the other, and rub them together, grandpa-at-Thanksgiving-style. But unless you're a professional chef, you should avoid this temptation. You won't get the results you want, no matter how cool it looks. Instead, grab the steel's handle in your non-dominant hand, and hold it perpendicular to your work surface, placed on a towel for stability. 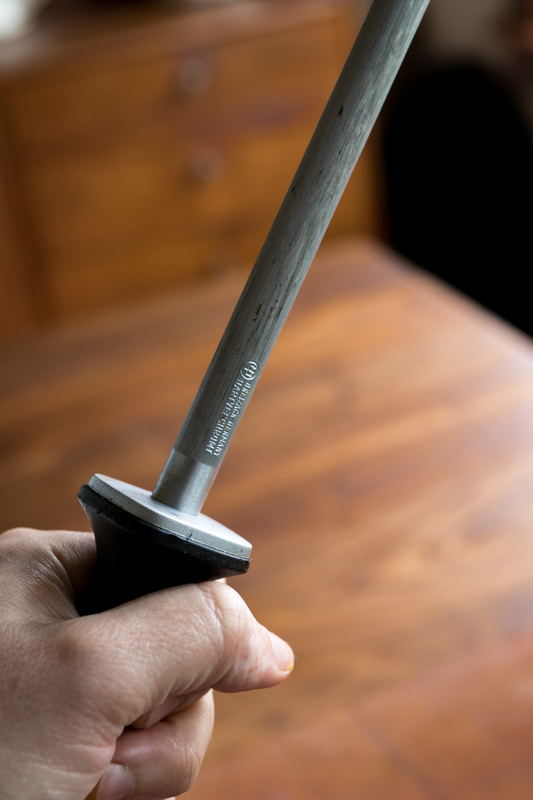 Then, draw the knife backwards as you run it down the blade; you'll start at the top with the tip of the knife touching the steel, and end at the bottom of the steel with the heel in contact. Make sure you do this an even number of times on each side (I like multiples of three) to keep the blade aligned. A sharp edge for cutting tools can be anywhere from 20-35°. 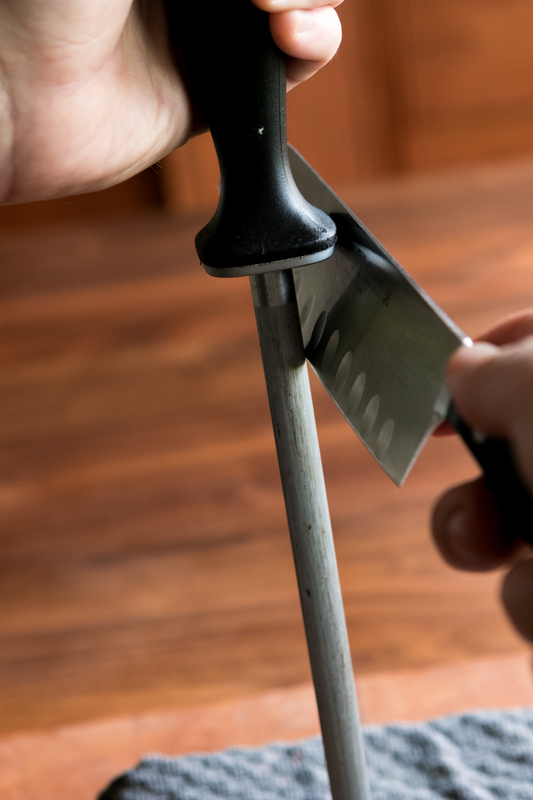 The truth is, you probably don't know at what angle your kitchen knives are sharpened. I don't either, but I also don't care. What I need is a way to reference the knife so that I keep it consistently in the range. The simplest way is to use the steel to help you. Place the knife's blade against the handle. This will let it sit at 45° to the steel, which is an easy visual reference. Then, draw your knife down. "But wait, Allan!" you say. "45° is not in between 20 and 35." That's true. But while the top of the blade is 45° to the side of the steel, the cutting edge, which is made of two planes that meet at a point, is only half that, or 22.5°. So, you are actually steeling each side of the cutting edge at 22.5°. This is why it's essential to treat each side with equal strokes. So, steel your knives! You'll like it! [addendum] I have no argument with your assertion that the left and right sides of the blade must be worked equally. I personally use two decay (two strokes on the left side, two on the right, one more on the left, final stroke on the right) on the steel before each use, higher-decay numbers on the bottom of my coffee cup for edges that are in poorer shape. Twenty-five decay on fine-grained, unglazed ceramic will take a butter knife to shave-sharp, if one maintains proper angle -- that's 325 strokes per side. Your phrasing is a bit muddy here. To clarify, a wire edge is not a cutting edge; it is the excess material left attached to the cutting edge after sharpening but before stropping. Your premise is correct: realignment of the cutting edge before each use is proper knife maintenance. My second quarrel with your article is the entire paragraph beginning with, "But wait, Allan!" "Wait," indeed: the edge is at the apex of the sharpened planes. If you use your steel at 45° on each side, you are creating a ninety-degree edge. While the crystalline structure of steel is 90° on a molecular level, the angle one should sharpen to is more acute (and the steel should match that same angle). I personally sharpen and steel my slicing cutlery at 15° on each side, for a cutting edge of 30°. Choppers get a sturdier 45-degree cutting edge, sharpened and steeled at 22.5° per side. I really appreciated your article, and I hope I didn't come off as didactic or pedantic. I would like to add the usefulness of a ceramic coffee cup base for sharpening one's pocket knife.